I have an idea that I want to throw out for discussion: helmets. English heraldry uses helmets on all coats of arms, as do many other heraldic traditions, but not all. Of the bearing I have seen with rendered with helmets all the helmets are of the sort that would have been used in a joust or combat, the blazon rarely specifies much on the helm, often just the word "helm" or possibly "miter" for clergy. 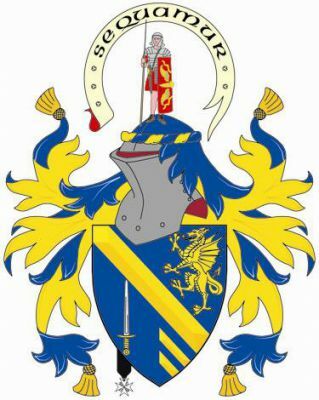 Since the Coat of Arms were designed for Knights this makes sense. Yet for weal or woe the day of the joust is long since past. So why don't we update the helm to the 21st century? Why not use a firefighter's helmet if the armiger is a firefighter? Or a motorcycle helmet for Harley-Davidson? What say you? There are examples of other headpieces being used as helms. I've seen an item described as a fighter helmet (but which looks more like a motorcycle helmet) used for a military aviation school, and there is a grant from the Canadian Heraldic Authority to a citizen of Nunavut which uses the hood of a parka as the helmet. I'm posting from my phone, so I can't provide links, but perhaps someone else can? I can understand your point of view, Ed, and I have seen a handful of emblazonments which use "modern" stand-in for helms - like the fighter pilot and the parka that Jeremy mentioned (I'll see if I can find links for him/you), and well as one that used the US Army's current Advanced Combat Helmet (or ACT). The major problem that I see with these non-helmet attempts is that none of those headgears use crests - putting a torse and a crest on a motorcycle helmet just isn't right. I suppose that if an armiger wanted to forgo the crest, then it might be slightly less objectionable. However, any attempt to modernize the "classic" coat of arms is bound to run into an even more fundamental problem. Namely, that coats of arms are historical remnants by their nature. For the majority of its usage, heraldry has been disconnected from the pageantry of the tournament joust at which the helm (and crest) would have been physically worn. If memory serves, the last such joust in Britain was held under King James VI/I Stuart (r.1567-1625). Thus, any post-Jacobean use of the helm and crest in heraldry has been a historical rather than practical. What I'm getting is that coats of arms are inherently anachronistic; any attempt to modernize them with motorcycle or firefighters' helmets widely misses the point. Ed, I forgot to note that another option is always to just leave the helm out of your emblazonment altogether. I have seen many fine examples which place the torse and crest right above the shield, without the helm or mantling. This can make for a very simplistic and clean rendering of your arms. Well the parkas seem to work a bit, but with the 3rd one I get more of a feeling that I am looking at some civic arms. Edward Hillenbrand wrote: I have an idea that I want to throw out for discussion: helmets. English heraldry uses helmets on all coats of arms, as do many other heraldic traditions, but not all. Of the bearing I have seen with rendered with helmets all the helmets are of the sort that would have been used in a joust or combat, the blazon rarely specifies much on the helm, often just the word "helm" or possibly "miter" for clergy. Since the Coat of Arms were designed for Knights this makes sense. Yet for weal or woe the day of the joust is long since past. So why don't we update the helm to the 21st century? Why not use a firefighter's helmet if the armiger is a firefighter? Or a motorcycle helmet for Harley-Davidson? What say you? 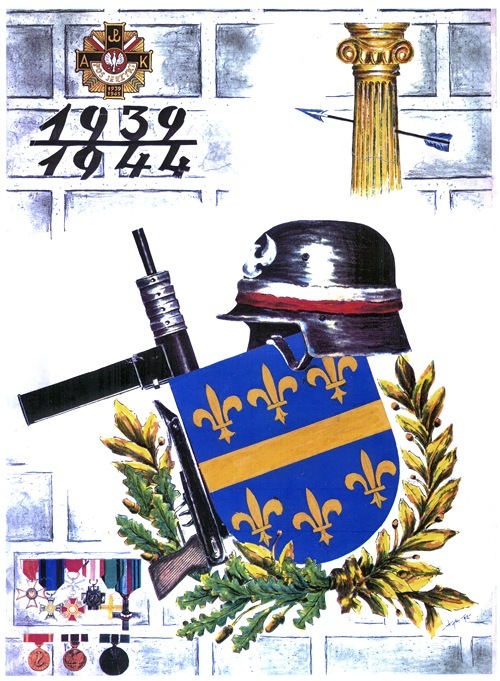 In the previous forum Kaj Malachowski and I showed two coats of arms of the modern helmet, so they remember. One is the German coat of arms, adopted probably in the 20s of the twentieth century, the helmet mod. 1916 (Stahlhelm), the second, is a Polish Noble coat of arms, with a captured German helmet from World War II, used frequently by Polish partisans and resistance. These are all very good examples! I love the parka and find the use of the German helmet very moving. In the US the use of a helm has never been required (but of course, we're Yanks and the rules don't apply!) These examples are convincing me that we CAN update our art and make it more relevant to the 21st Century while remaining true to the heritage of heralds: the blazon is the written word and meant to be interpreted as the armitger wishes. i.e. azure. As an employee of mine found when he ordered some job shirts with a blue Star of Life on them, the company's version of azure is very different than what most EMS providers consider the "proper" blue! You have all given some good food for thought here, including retaining the traditional jousting helm. Just as a side note, firefighting helmets in the US from the 19th Century were made with a crest. This tradition continues in the current helmets of today with a small raised center line that serves no useful purpose. The SA Bureau of Heraldry has issued some registration certificates with non-standard helmets. 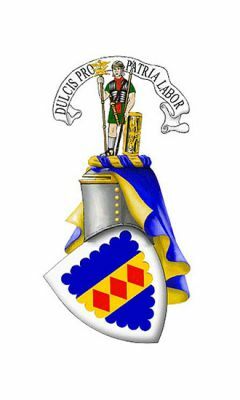 One had an ancient Israelite helmet, another ( http://armorial-register.com/arms-za/go ... b-arm.html ) a Spanish morion. There are also examples online of ancient Grecian helmets being used by modern Greek armigers -- they, at least, are fairly similar in shape to the tilting helmet. The addition of western European medieval mantling and crests to these helmets is rather jarring (IMHO). To clarify a point: while it is true that the English College of Arms will not grant personal arms without a helm and crest, there is absolutely no requirement that an English armiger display the helm in every achievement. Arthur Radburn wrote: One had an ancient Israelite helmet, another ( http://armorial-register.com/arms-za/go ... b-arm.html ) a Spanish morion. I like the Spanish morion; I wonder if they've ever tried a Roman galea... All of these are fine, I suppose, as long as they don't try to bolt a crest to it (as was done in the linked-to arms), since none of these had crests. JMcMillan wrote: To clarify a point: while it is true that the English College of Arms will not grant personal arms without a helm and crest, there is absolutely no requirement that an English armiger display the helm in every achievement. I did not know that the crest was required - I thought that the shield was really the only mandatory part. Additional thought: Since a specific style of helmet is not usually specified in a blazon, if a certain style of helmet is especially important to an armiger, then it might be best to include as part of the crest. For example, if an armiger really, really wants a Corinthian helmet in his arms, then perhaps his crest could be a “demi- Hoplite, proper” or a “demi-lion rampant, wearing a Corinthian helmet”. Last edited by steven harris on 25 Nov 2012, 15:54, edited 6 times in total.